Click ‘Save’, and the panel will slide across into the Fill-in Finder panel. 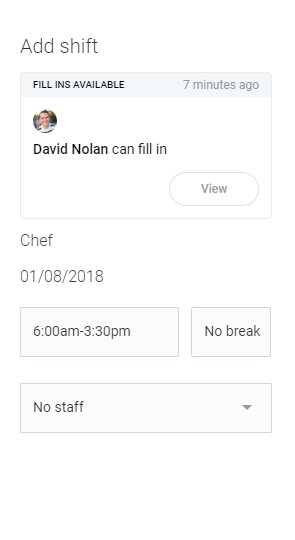 Select all staff that you want to specifically offer the shift to, or tick the box next to ‘Available’ to include all available staff. If possible, you’ll be able to then choose to assign the shift directly or offer the fill-in. 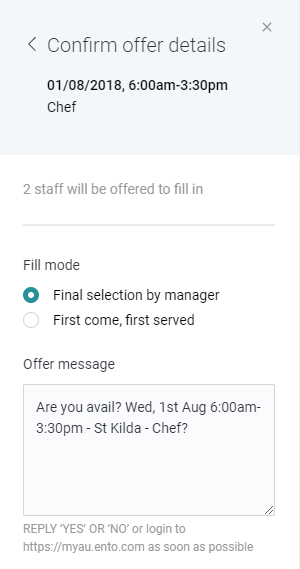 After clicking ‘Offer to fill in’, you’ll be asked to choose the ‘Fill mode’. Edit (or leave) the offer message that will be sent to the chosen staff. Finalise the fill-in by clicking ‘Offer’. Note that the list of eligible staff will only include those who have been set up to work the role the shift is for, AND who are not already rostered on somewhere else at the time of the shift. Each of the staff selected will be contacted, and you will be notified as they respond. Once a staff member has been assigned to the available shift, the system will advise anyone who enquired that the shift has been filled by someone else. When a fill-in shift is marked as ‘Final selection by manager’ and you’re notified that a fill-in is available, return to the roster housing that shift. Double-click the shift to edit it. The notification card on the panel will advise how many people can fill-in and clicking ‘View’ will take you to the fill-in finder to confirm one. 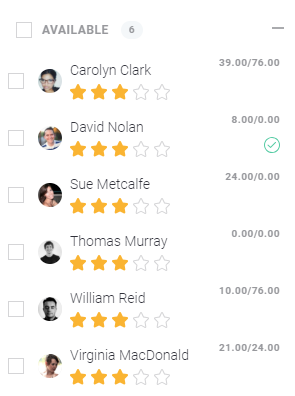 Once you view this list of staff, simply choose to assign one – the staff with a tick are the ones who have responded that they’re available. 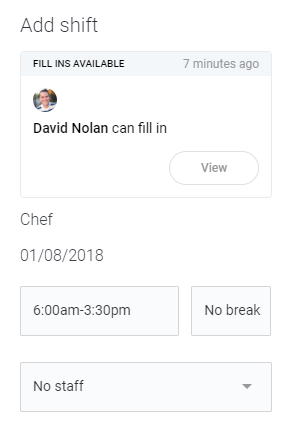 Once someone has been assigned to the available shift, the system will advise anyone who enquired that the shift has been filled by someone else. If you need to fill multiple shifts, read up here on Shift batches.